1 of 5 Trim tops and bottoms from eggplant. Cut each into 6 lengthwise slices, about 1/2-inch thick. Spread slices onto 2 large cookie sheets lined with paper towels. Sprinkle slices with 1/4 teaspoon of the salt, then turn slices over and sprinkle with remaining 1/4 teaspoon salt. Let stand 15 minutes, flipping slices halfway. 2 of 5 Heat grill or grill pan to medium-high heat. Quickly rinse eggplant slices under running water; pat dry. Spray both sides with nonstick cooking spray. Grill slices until softened and nicely marked, about 4 minutes per side. Return slices (do not overlap) to large cookie sheets (without paper towels). 3 of 5 Heat oven to 350 degrees F and coat a 13 x 9 x 2-inch baking dish with nonstick cooking spray. In a small bowl, stir together 3/4 cup of the mozzarella, the ricotta, egg yolk, Italian seasoning and pepper. Stir until well combined. 4 of 5 Divide red pepper pieces evenly among eggplant slices, placing them on the wider end of each slice. Top each pepper with a heaping tablespoon of cheese filling. Place 1/2 cup of the marinara sauce on the bottom of the prepared dish. 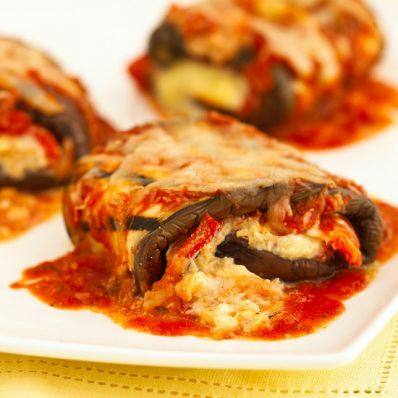 Roll up eggplant slices, starting at the wide end and enclosing filling. Place in dish. Top with remaining 1 cup marinara sauce, remaining 3/4 cup mozzarella and the grated Parmesan cheese. 5 of 5 Bake at 350 degrees F for 25 minutes. Remove to wire rack and cool at least 10 minutes before serving. Add salt to taste.